CEVL are a Midlands based Transport Logistics Company offering a professional trade plate delivery service of your vehicle with full UK coverage. 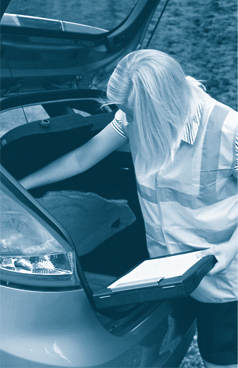 Our drivers have all been trained to inspect your vehicle for damage. Upon collection of your vehicle, our driver will undertake a full inspection depending on conditions, and a copy of the inspection form will be left with the customer. CEVL offer a comprehensive Detailing Service from their Cosford Premises. As a Dodo Juice authorised Detailer, and with our Concours Winning vehicle detail team we can make your car look better than when it came out of the factory! We manage a fleet of Wheelchair access and mobility vehicles and our drivers will undertake a professional handover to meet the customers needs making sure they are aware how all the systems work. Central England Vehicle Logistics is a specialist vehicle services company based in Atcham, Shropshire. From our central England premises, we offer a nationwide Driven Delivery Service, as well as Trade Plate Delivery, Vehicle Storage, Detailing, Valeting, Vehicle Transporter Delivery and a Specialist Handover Service. As a Dodo Juice Authorised Detailer, we offer the best level of detail possible. Combine this with our prestige Valeting service for the ultimate in car cleaning. Our experienced Valeters & Detailers have helped cars to win Concours competitions across the country, as well as preparing cars for photoshoots for magazines! With the highest level of security, our Storage facilities are second to none. With all of the premises covered by Digital CCTV, and the building fully alarmed and insured, you can be sure your car is in the safest possible place. At CEVL, we are not satisfied unless we deliver the perfect service every time. We are approved suppliers for many UK National and independent companies including Carillion PLC, Enterprise Rent-a-Car, British Car Auctions, Aston Barclay Motor Auctions, Burnt Tree Vehicle Hire, Dagenham Motors Ford, Evans Halshaw Ford, plus many others. With almost 50 Trade Plate Delivery Drivers, we can cater for both individual car transportation, or entire fleet transportation. We are also a Dodo Juice authorised Detailer, and we aim to give your car the best treatment possible.